Best Reference Books For Class 12 CBSE Chemistry – Buy Here, with pros and cons there are list of best reference books, practice papers etc. As soon as we reach class 12th, the time period between April to March is the most crucial. This time period is going to decide where we will be in the next few years. If we favour this time in a well organised manner, every thing will happen in the way we planned it, the only condition is we have to work hard, burn the mid-night lamps without any excuses and see how well our hard work and dedication pays off. But again the question arises to many minds that how is this possible, just one year time and an ocean of syllabus. You would had heard these words a lot of times “Nothing is impossible”, and this is so true. If we just focus our goal towards a particular aim, note down these words, the whole world conspires in your favour. So, do not ever let your moral get down, work hard with all your zeal. Excellence is never easy, if one aims towards that, there are a lot of obstacles that we have to face. We have to make choices. One such choice that has to be made is the selection of a good book. A good book and the understanding developed with the author, the knowledge you have gained from the book, your efforts never goes futile. So, here you make your first choice with the selection of the most suitable book for yourself that you can understand easily. See, nothing is achieved so easily, if it had been then it would had been meaningless. Whatever you want to do, you have to be determined towards it with whatever it takes. In this article we will be helping you with all this, that what all books you should buy along with your NCERTs for your boards and competitive examinations, so that you can pass with flying colors. The only condition is, if you are ambitious towards a particular goal, then give it your 100% without leaving a single thing to future, as things left to future keeps on procrastinating. So let’s discuss what all books should be used for Chemistry along with your NCERT, which is of course your course book. As NCERT is our course book, so it holds a great importance during preparations. So, give your first priority to NCERTs for board examinations point of view. First cover all your topics from this book and then go for other books. Let’s discuss some pros and cons of the book. If you are thinking to buy this book, Then Buy it for just – Rs 104 Rs. From the given link. Pros: If you are preparing just for your boards then go for NCERTs only, as 90% of times direct questions are asked from NCERT books, so their is no need of going for any other book as it is complete in itself and will make all your concepts clear, if you study it thoroughly without giving even a single day break. Cons: As we have discussed earlier too that it is your course book and it has every thing that you need from board examinations point of view. But let me tell you, if you want detailed study of the topics, you will have to go with other books. You have some plans of appearing for competitive examinations then it is mandatory that you buy some good books along with NCERT, as individually this is not going to help you. Now what are some other books that we can go for along with our NCERTs. It is a contradictory topic, as everyone is going to put their own thoughts of the books and then it becomes difficult that whom to listen or whom to ignore. So, here we are going to tell you the names of some good reference books along with telling their pros and cons. Read all the things attentively and then make a decision, which book you actually want to invest on. Modern Publication’s ABC is one of the book suggested by many, and why not, this is counted among the best reference books for Chemistry and you must have noticed that everyone suggests us to buy this book because it is a complete package of all kind of preparations. But as every coin has two faces, every book too has some positive and some negative points. Let us discuss them. Modern ABC is costly according to the Arihant’s NCERT, Buy it for Rs 1200/- From the given link. Pros: This book has everything what all is required for a good preparation. It provides us with detailed explanation of every single topic, helps us in clearing all our concepts. Books too contains HOTS (Higher Order Thinking Skills) questions, NCERT Solutions are there, NCERT Exemplar parts are there, book provides us with miscellaneous questions too, and a lot more other questions too, so, if you want to prepare for competitive exams, this book is perfect for you. Cons: Now you must be wondering that if it has these lots of positive parts, then how this book could have any flaws. So, you are thinking right, book do not have any such flaws, but there is something that you all should know before purchasing the book. If you are not in the mood of sitting for competitive exams, then there is no such requirement of this book, you can easily cover the syllabus from NCERT only. Explanations of every topic is given in so much of detail and too many questions are there in the book, that most of them are not required if you have no such plans of preparing for JEE, NEET, and many other examinations. You can gain a lot of knowledge from the book, if you read it properly and thoroughly by making all your concepts clear. In the last few years, Pradeep’s New Course Chemistry has gained so much of attention that now it is too counted among the best books for preparations. So, if you are making up your mind in purchasing this book, so let me tell you it is going to be a quality investment. 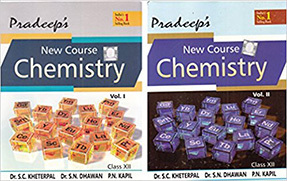 Pradeep’s New Courses Chemistry is now available at Rs 1480/- buy it now from the given link. Pros: For competitive point of view, just buy this book and practice each and every question there in the book with complete concentration. It will surely help you in achieving your target. Book has every thing, concepts are explained in a very neat way, the book is a complete question bank, providing you with each and every type of question, so that you can prepare for your boards as well as competition. Just you need to pull up your socks and start practicing from the very first question. Cons: Again if having no such aim of becoming a doctor and an engineer, and just want to pursue with your degree graduation then NCERT is enough for you, because reference book will provide you with each and every type of question, some of them might be out of syllabus, so you will just get confused, and therefore its better to stick particularly towards your course book. It could help you better for scoring goo in your boards and getting admission to some top level college. As i have said if you have no such interest in sitting for medical papers and engineering papers, so then there is no need of buying these books, but in case you want to explore your knowledge and become best of both worlds, then just go for it. There is no such hard and fast rule that you only have to purchase the book if you are preparing for some competitions. We never know, the knowledge we gained today, how it will help us tomorrow. So, if you are keen learner just go for it. This book i can personally suggest you that it is among one of the best books for chemistry preparation as the book covers all the previous 10 years questions along with their solutions and not only this there are some 5 to 6 sets of unsolved papers to in the book which provides great help. So just go for it. Arihant’s All in one is famous reference book but is only useful when you started your preparation before the session starts of 8 to 10 month before of the exam. You never know when the same type of question hits you in the exam. Buy this book from here and then get the detailed information. All in one is not much costly and if you want to learn in detail then visit this link below. And but the book at Rs 391/- from the given link. Again one the best practice books for chemistry preparations. We are not criticising any of you, but just aiming at providing you with the facts that what all it takes to achieve success. So, it is a heartiest request to all those who have some dreams in their eyes, who are planning to do something great. The session has just started, work hard with all your dedication and the see what all wonders happen in the coming time. You can even buy Full Marks to actually get full marks. Just kidding, although book will seriously help you in scoring good, but only buying is not enough, you will have to work hard and pay complete dedication to the practice papers the book contains. Every year when the results are announced we come to know about a lot of students who topped, so they are also same as we are, not born with some hidden magical powers, but yes what they did was they did not give up, they tried and tried, set some strategies and worked hard the same manner it requires for a student to achieve good marks. As this is also among the best books for preparation of Board Exams, so mostly board aspirants also go for this book. The book provides a complete question bank, which is really helpful for the preparation and sometimes 60 – 70% of questions comes in repetition, so isn’t it wonderful that your confidence level increases. Buy Xam Idea at Rs 777/- From the link given below. We know when you are in the search of a good book for yourself, it becomes completely a hassled situation, as every other book seems to be of a lot of use and they are too. None of the book is meaningless, each and every book has something or the other that provides us with knowledge. Oswaal’s paper collection is counted among the best practice papers. Oswaal provides you with every type of paper like sample papers, CBSE topic wise papers, CBSE chapter wise papers along with their solutions. You can even buy this book. So, this is the best collection that you could be provided with. Although NCERT for scoring upto 90% marks specially in chemistry, but if want to gain some extra knowledge, you can use any of these books. All these books are equally good and if you are determined with the idea of that you have to pass with flying colors, just give your 100% towards these books. Once you are clear with every single concept of the book, no one can ever defeat you. Your target should be to wind up with your syllabus at least before three months of your exams, so that now you can completely be focused towards your revision part, as it is the most important thing to practice what all you have studied within this time, you come to know at what level you are, do you need to pay more focus towards some topics or whatever you have studied it’s all fine and now you just need to practice more and more questions to make your base more strong. There are some books that will help you to do so. Just buy these books and start your final preparations. At this time, when we are completely in a state of confusion, we need to go to those who have actually some good knowledge about the that is our teachers, they can guide you to the best. But firstly make sure for what purpose you need the book, are you just restricted to your board examinations and aiming at scoring good so that you can get admission to some good college for your graduation or planning for something like appearing for competitive examinations and pursue some professional course. Understand this is not a last minute decision, that from some where you got a wake up call and now you want to sit for competitions too. I hope you know the level of toughness of competitive examinations like NEET, JEE, NDA, other engineering or medical examinations. So, you have to prepare from the very beginning. Hope the article was useful to you, if you have any queries you may drop down a comment below. We will try to solve it to the best we can. Thanks for paying attention and good luck for your session.